We know our Whey! It's from the EU and UK and is hormone and GMO free! 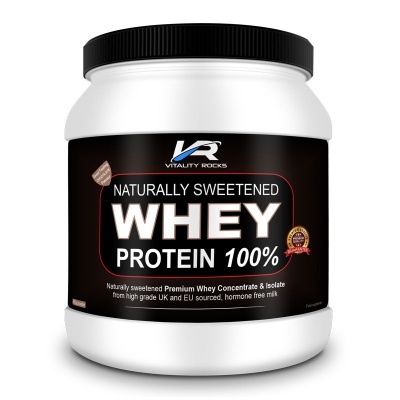 Vitality Rocks Naturally Sweetened Whey Protein 100% is a premium whey protein supplement, derived from a blend of high quality whey protein concentrate and whey protein isolate. At Vitality Rocks, we set out to go above and beyond when formulating our nutritional supplements and we believe that our Naturally Sweetened Whey Protein blend is one of the most natural whey proteins you will find available anywhere today. We use only the highest grade, hormone free milk sourced from British and EU grass-fed cows and use only natural flavours and sweeteners. Unlike other proteins on the market, our whey protein contains no nasties and we know where the raw ingredients come from! Providing almost 22g of high quality protein per serving to support accelerated muscle growth, maintenance of lean mass, shaping, toning and strong bones. For maximum effect, we use a combination of premium quality whey concentrate and isolate and you won't find other cheap protein sources bulking out our naturally sweetened blend. This is an ideal source of extra protein whether you are male or female and the benefits are plain to see! Enjoy 1 to 3 servings (heaped scoops) per day, or as required. Add 1 scoop (30g) to a large glass of water, juice, milk or other liquid. Stir well with a fork or blender, or shake in a protein shaker to mix. This premium whey protein powder can be used before exercise, after exercise or simply as a tasty protein shake any time of the day. Whey protein concentrate (milk, soya lecithin); Instantised Whey protein isolate (milk, soya lecithin); Reduced Fat Cocoa Powder, Natural Flavour: Chocolate flavour; Sweetener: Stevia Leaf Extract (Steviol glycosides); Emulsifier: Soya Lecithin; Thickener: Xanthan gum; Anti-Caking agent: Tri-Calcium Phosphate. Contains NO GMOs, hormones, artificial colours or sweeteners.